We all know the way to a man's heart is usually through his stomach, so why not cook up some love based treats this Valentines Day and really show him how much you care. 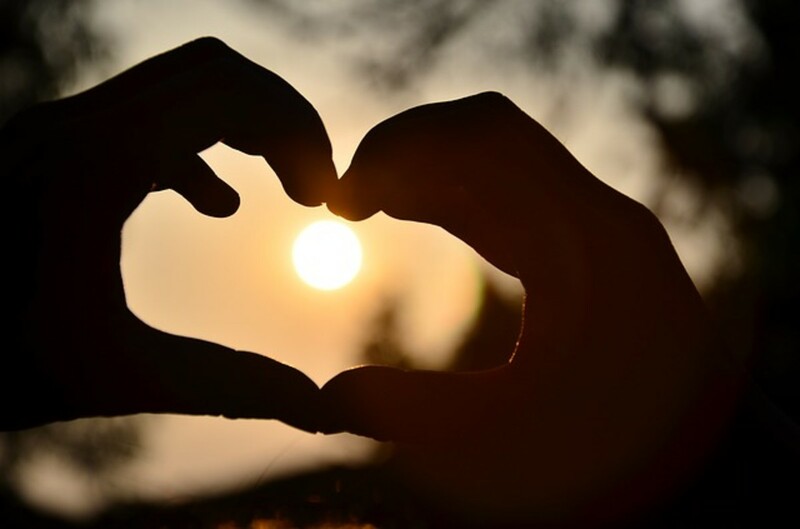 I have searched the internet for a range of Valentines Day themed recipes to get your through a whole day of romantic food, that is sure to keep you man happily feed and happily in love. 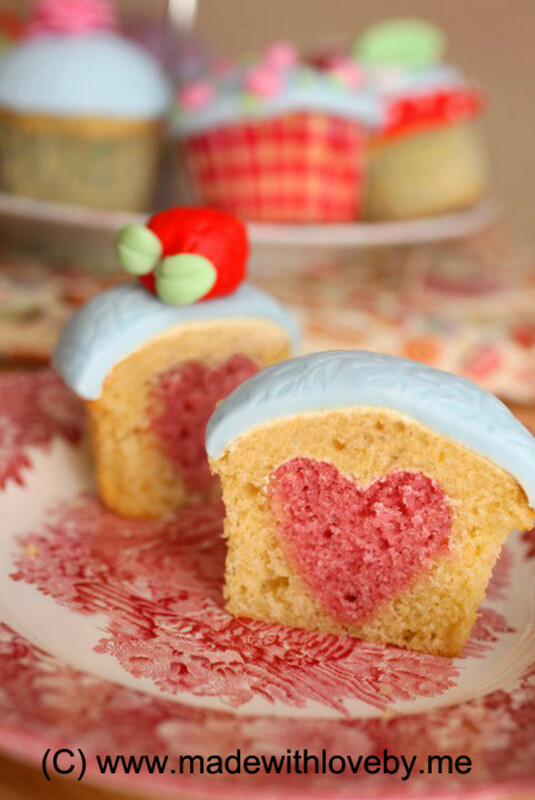 From breakfast through to dinner, with some sweet treats in-between I have found recipes that add a Valentines Day twist to them all. Hopefully you will find a recipe you love and something you will both enjoy eating. Plus if it's a family day, then there are a few recipes that the kids will enjoy helping you make, and even more, helping your eat. All you male readers out there, this hub may be directed at women, but that is me just stereotyping. Us ladies would love for our man to treat us to some romantic food on Valentines day too. And if you can cook any of these dishes you will be sure to impress us! If your looking for a Valentines Day craft to do with your children you will find a great selection here. Valentines Love Bugs, Treat Bags and cute gifts from children to give their friends. All are simple and easy Valentines Day Crafts for kids. So we need to start the day off with a nice breakfast in bed. 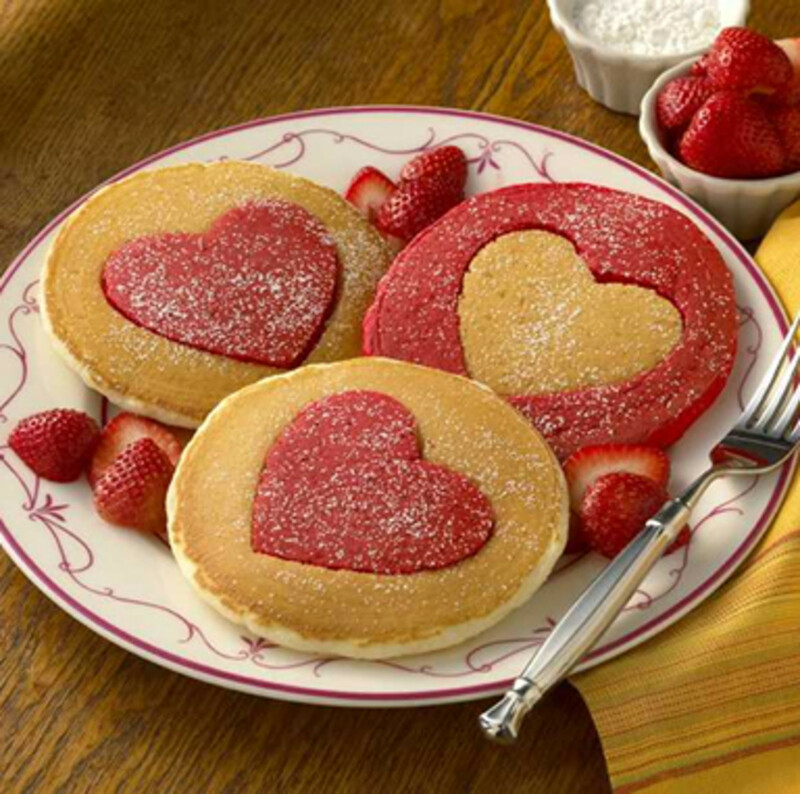 What about these great heart centred pancakes from Gatorade Military? You simply make up regular pancake batter, split it in half and add some food colouring to one half, then make your pancakes, use a cookie cutter to remove a heart from the centre and switch them over! Simple yet it looks very effective. Serve with a nice strawberry or raspberry sauce and some fresh fruit and your sure to win him over. Expect many thankful kisses and hugs in return for the rest of the day! Actually any males reading this, us women would also love breakfast in bed if you fancy trying your hand at some pancakes too! On to lunch time. You don't want anything to heavy so why not try out this simple and sweet heart shaped ravioli that I found on Vegalicious.org. This is sure to show him just how much you care and it'll taste great too. The recipe is for vegitarian ravioli but you could just as easily change the filling for something else of your choice - maybe Salmon and Ricotta or Sausage meat with some Chilli for a spicy kick. 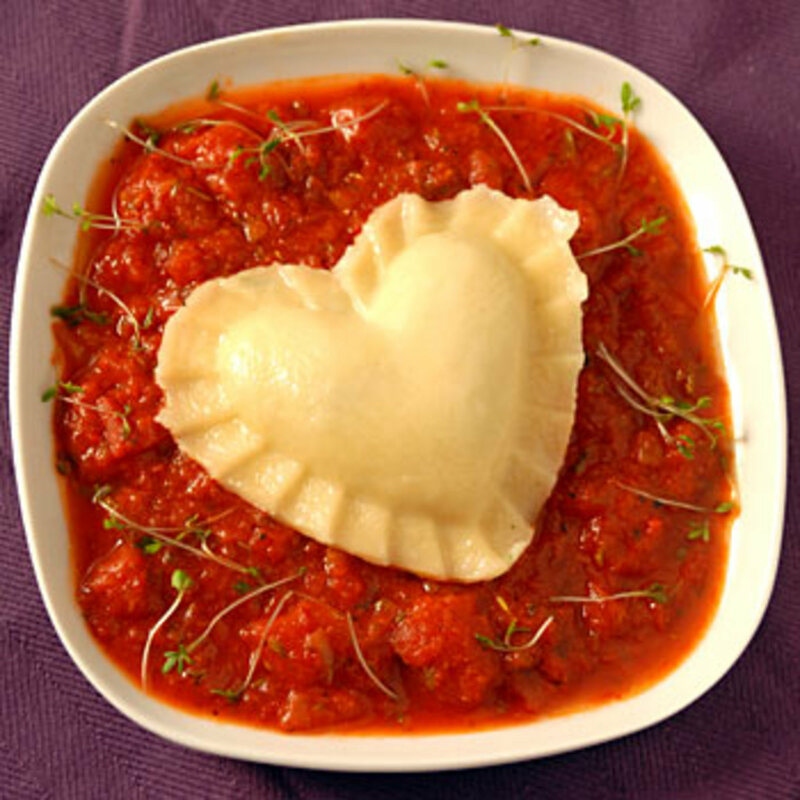 Whatever you chose to fill your ravioli with, the heart shape will be a great fun alternative to regular square ravioli. These will also be a great treat for your children to share with their friends at school! All of us love a posh meal now and again, but we also all love a take away! 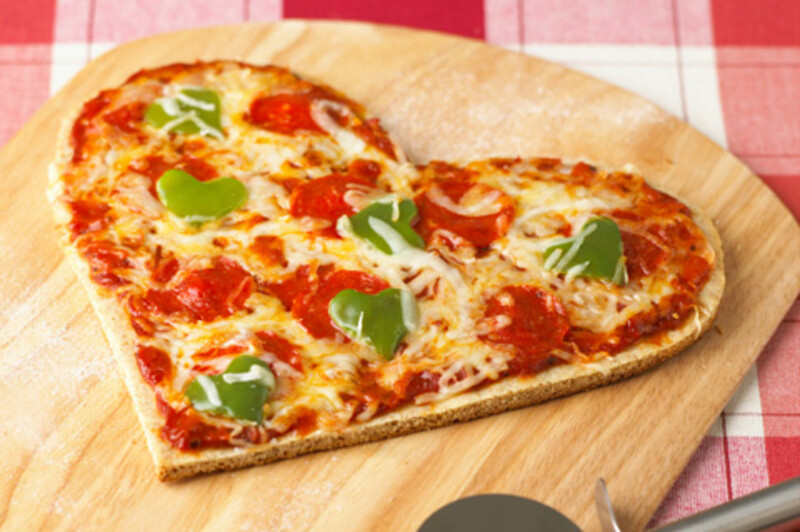 So why not treat your man to a romantic night in with a homemade Heart Shaped Pizza with all his favourite toppings, while your curl up on the sofa with a good film. This recipe can be found over on Chef Mom on She Knows. It is pretty simple, you just have to make the dough yourself! If you have a multi function bread maker you may find it can make pizza dough for you, then it's just a case of rolling it out and adding the toppings, before placing it in the oven to cook. Dominos eat your heart out, just be sure he doesn't think you'll be whipping one up every weekend for him! If your having a family night instead, I'm sure the kids will love topping the pizzas for you! From the mind of the Mad Baker came these amazing looking pink Macaroons filled with fruit and cream. 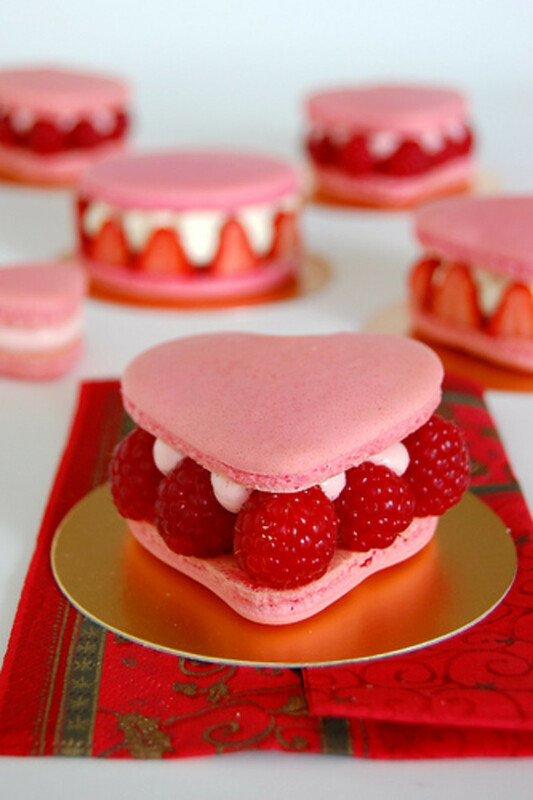 I'm sure they taste just as amazing as they look, and they will make the perfect dessert to end a romance filled day of Valentines treats. 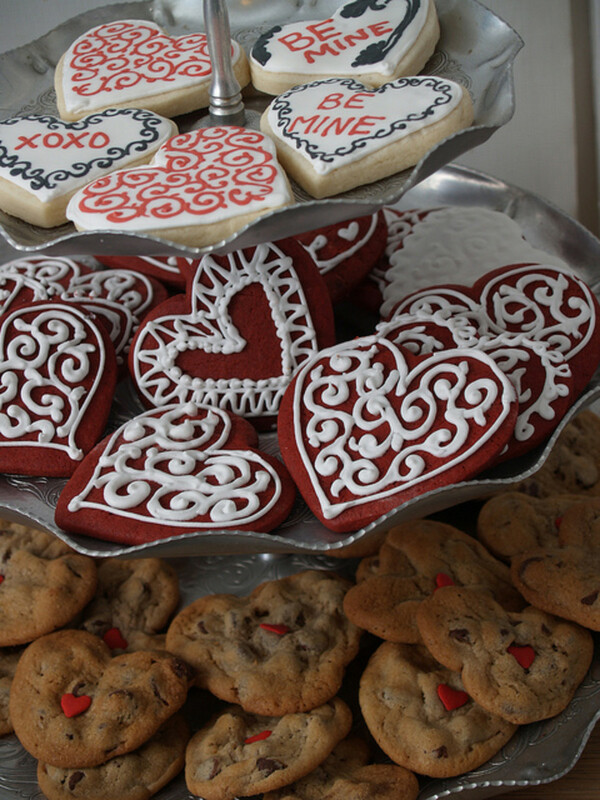 You can make them heart shaped or simple cicles as the wow factor will still be there. They will be a sweet treat to end the day on, but not too heavy either - and that's got to be at least 1 portion of fruit right? So they are 50% healthy! hehe! Your man will be in awe of your creative culinary skills if you cook just one of the treats I have mentioned here, but I think these macaroons are my favourite! Freezer crock pot cooking is a great new method to help you eat more healthy home prepared meals when you just don't have time to cook. This is a great pork recipe meat for couples! Freezer crockpot cooking is a great new method of preparing and cooking healthy meals. This Chicken Teriyaki recipe is perfect for busy working couples. This is a great simple freezer crockpot cooking recipe for Garlic Chicken. Tailored to couples, just multiply for more. Really yummy, cheap, helathy and filling! 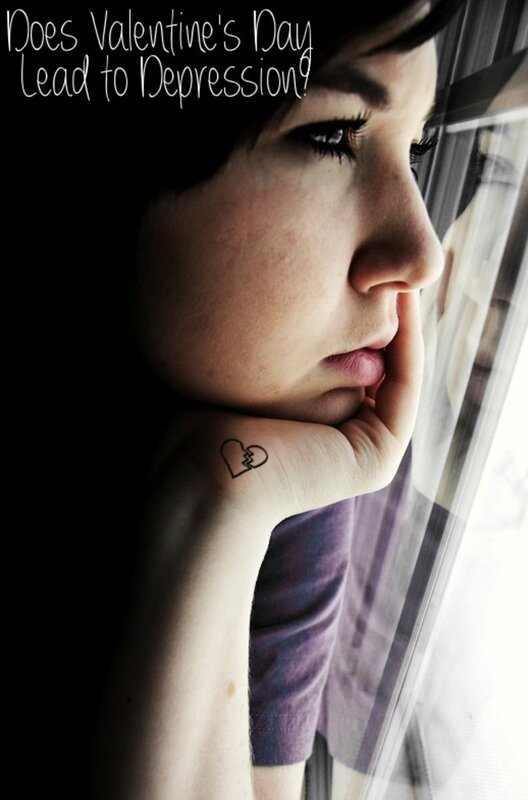 Very creative and sweet ideas. I have enough time to practice before next Valentines day. Thanks. Aww nIce to hear from another Welsh person! Glad you like them! 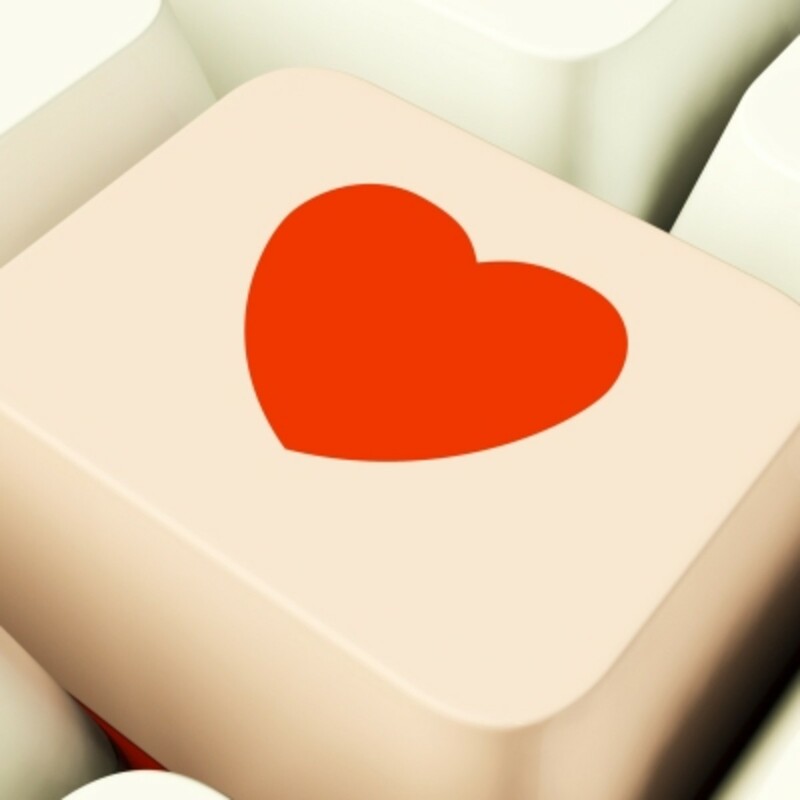 Great valentines ideas for all romantics. @Amanda108 they are awesome arent they, so clever! @Mike Robbers I'm glad you like them, the pizza would be great! Thumbs up! Really enjoyed it! Interesting, useful and definitely beautiful! I'd like to have that heart-shaped pizza right away! Yum! I have been married over 20 years and I still feel the secret to keeping a man is to feed him. Aww so glad you liked all these ideas. I thought they were so much fun I had to share a few! This is a Valentine's Day/heart lover's paradise. I am all about using hearts everywhere in February. thanks for sharing all of these great ideas. @OmParamapoonya The macaroons look so amazing! Pretty I'm not brave enough to try my hand at Macaroons, maybe one day!